There are a number of things you want to check when you have problems with an iCalendar feed. Are you sure the right calendar is turned on in your client? When you have many different calendars make sure that the right calendar is turned on. 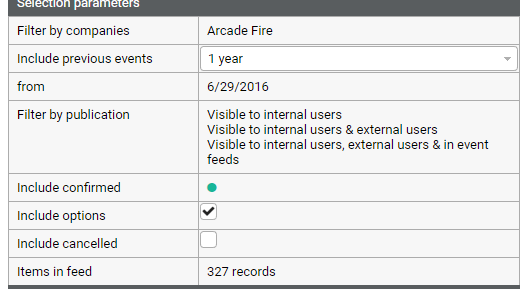 Are the ICalendar feed settings in System One correct? Every individual feed has settings that filter what you receive in your feed. You can access your own feeds, by going to the feed overview. Perhaps you don't see any cancelled shows in your iCalendar feed, because of the settings of your iCalendar feed. Did you wait at least 1 hour? It can take some time for changes in System One to appear in your ICal. Is your ICal client correctly refreshing? It happens that your device is subscribed to a feed that no longer exists in System One, or perhaps the device settings are incorrect, so the feed is not refreshing. The most thorough thing to do is to remove all the subscriptions from your device and subscribe again. Check the related articles for an instruction on how to do this on your device.